For years, reciprocal and turbo-prop aircraft owners and operators only had one option for aircraft de-icing products. The introduction of Ice Shield™ in 1998, gave aircraft owners and operators a second option that they could count on for a quality product, that is delivered in a timely manner. Today Ice Shield is available for over 75 aircraft models. Although general aviation is the root and foundation of Ice Shield, recently we have been making strides to develop a high quality de-ice product for commuter and charter class aviation. While covering 85% of the general aviation aircraft operating today, Ice Shield has added capabilities and de-icing alternatives for the Bombardier DHC-8 family, SAAB 340, Beech 1900 and Embraer 120 aircraft models. Ice Shield is commited to providing a quality product, backing it with world-class service and competitive pricing. Ice Shield has developed de-icing products to be high quality with our 20+ years of engineering experience. Ice Shield's engineering staff uses state of the art technology and equipment including but not limited to: access to wind tunnel testing, LEWICE analysis software, Design-X software, and a research and development lab full of high quality de-ice testing equipment. The Ice Shield team works diligently daily to provide customers with a Faster, Better, Smarter de-icing product. Ice Shield de-icing systems are shipped within 48-hours of placement of order. This first class service provides our customers with a reliable, high quality product when needed opposted to waiting 60-90 day lead times. Customer service and technical support available via phone, internet and email. Any questions on installation, information about what boot to install on certain aircraft, or any technical concerns or issues can be answered by our technical support team. Ice Shield products are interchangable with original equipment. When an Ice Shield customer has original manufacturer de-ice boots on their aircraft and only one boot needs replacement, the entire aircraft does not need changed to Ice Shield boots. Ice Shield offers part-for-part replacement for original boots. A no-hassle warranty is available for all de-ice products. Ice Shield customers are provided with a new product with no questions asked with the return of Ice Shield boot. All Ice Shield products are FAA approved. Every product offered has been verified and approved by the FAA. Documentation of approval and support paperwork is available to customers upon their request. Emphasizing quality, value, service and selection, Ice Shield has become the preferred brand for aircraft de-icers. Owner/operators are switching to the Ice Shield de-icing product instead of OEM replacement due to the durability, reliability, and availability of products. The Ice Shield brand is OEM for Beechcraft, Epic, Lancair, Viking and Vulcanair. Ice Shield offers a network of authorized distributors throughout the world, so our de-ice products are readily available regardless of your location. 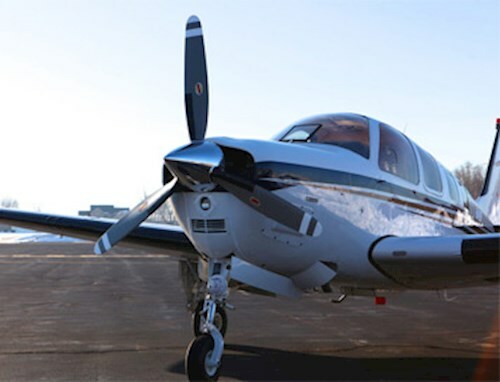 Additionally, a network of authorized factory certified installation centers provides convenience in picking the closest location for the aircraft owner and operator. No-charge 48-hour shipping is guaranteed within the continental United States and no-charge UPS ground to Canada is also provided. If there happens to be an occasion where the distributor does not have stock of requested part, our manufacturing facility has inventory available for drop shipment to the customer to ensure 48-hour delivery. Ice Shield customers count on superior products with unmatched customer service. Technical support, both on-line and by telephone, ensures your next de-ice installation will be smooth. 18 Million flight hours surpassed on Ice Shield boots. Product line expanded to 469 part numbers. Ice Shield adds the Dash 8 certification for DHC-100/-200/-300 and –Q400.